Depth of Field and Aperture | Portrait Photographer based in Eindhoven, the Netherlands. It is common knowledge among photographers that the Depth of Field increases when the aperture decreases, but by how much ? 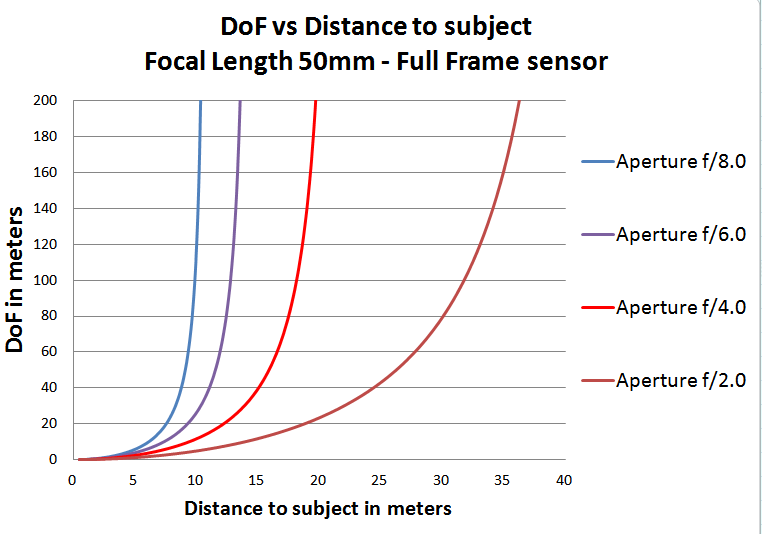 Unfortunately there is no simple relationship between the DoF and the aperture, but this article provides a accurate and simple answer to the question. – Case 1 : The subject is much closer than the hyperfocal distance and therefore the DoF is rather short. – Case 2 : The subject is close to, or even further away than the hyperfocal distance therefore the DoF is huge. In case 1, when the subject is much closer than the hyperfocal distance, the DoF is approximately proportional to the aperture number. For example if your DoF is 1m when you use f/4.0, then it will be 2m when you use f/8.0. This principle generally applies to portrait photography. The plot below is from the equation of DoF, it puts in evidence the proportionality of DoF with the aperture number at short focusing distances. 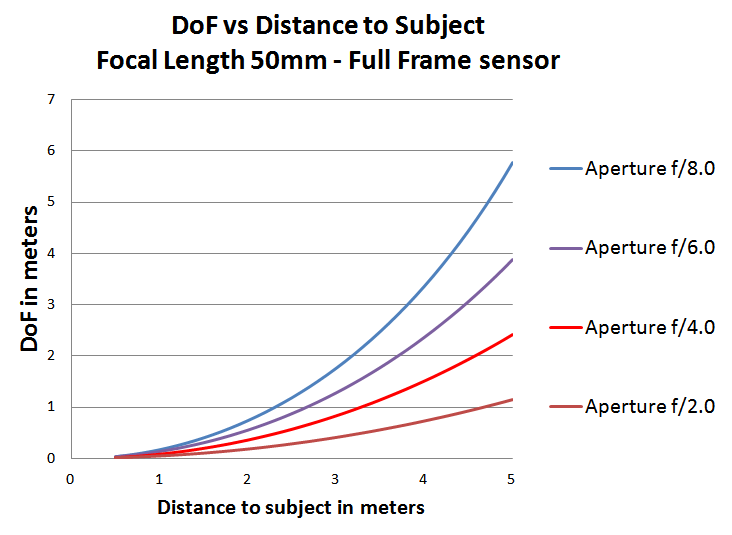 In case 2, when focusing close to the hyperfocal distance, the DoF is huge, and changing the aperture has a big impact on the DoF because it moves the hyperfocal distance. In this situation it is impossible to achieve a shallow DoF, but on the other hand you can maximize the DoF by adjusting the aperture and bring the hyperfocal close to your subject. The plot below is the extension of the previous one to greater focusing distances. In the domain of portrait photography the DoF is proportional to the aperture number, therefore the aperture can only modify the DoF in a limited amount. In the next articleI explain that there is another parameter called the “lens magnification” that can modify the DoF by many orders of magnitude.